Grace Lutheran Church West Springfield is proud of its continuing involvement with Habitat for Humanity. The ladies of Grace pose on the back porch. 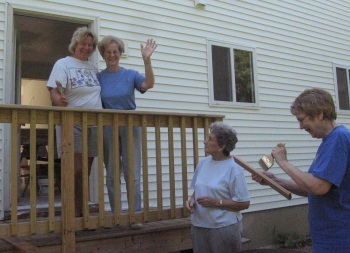 project in Pittsfield with Central Berkshire Habitat for Humanity through its affiliation with the Western Massachusetts Chapter of Thrivent Financial for Lutherans. 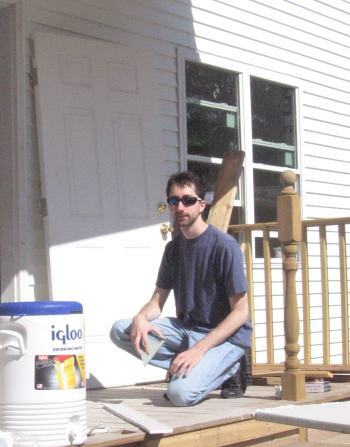 Eric cuts drywall on the front porch. In April of this year, Grace pledged $1,000 and two work days to support this project. Grace’s June rummage sale yielded $700 toward the pledge and the two work days were held Aug. 2 and Aug. 16. On Aug. 2 five members of our church (including our pastor) made the trip, and on Aug. 16 we had two cars and 9 participants. 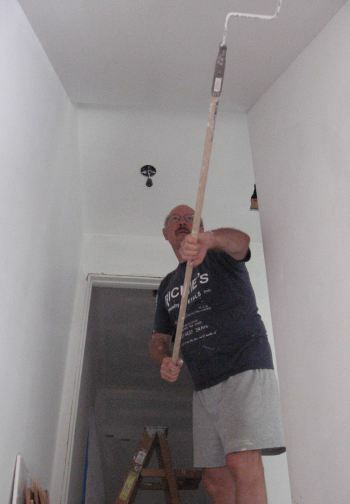 The days were filled with cutting and installing drywall, painting interior walls and prepping the woodwork. Our pledge will be successfully fulfilled when we raise the last $300 at our next rummage sale, coming up on Oct. 25. Ted paints a hard-to-reach area. A big thank you to everyone who volunteered in Pittsfield or contributed to the rummage sale. Because of you and others like you, this duplex at 131-133 Daniels St. in Pittsfield will now be called home by two families who have also been working alongside the volunteers to realize their dream. The house is scheduled for completion by the end of the year. This entry was posted in Events and tagged Habitat for Humanity by Eric Parizo. Bookmark the permalink.